One of the best parts of summer is the availability of fresh ingredients. Like the copious amounts of basil and mint that Amy bought at the farmer’s market and the greens that are in her own garden. I made a fresh greens salad with basil and mint vinaigrette. 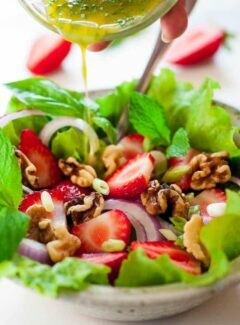 Don’t you just love a salad that has strawberries and walnuts in it? I know I do, and it’s such a simple way to have a tasty salad. The strawberries at our local Cub Foods were two for the price of one again and I always have to pick some of these up. The walnuts were toasted in the microwave. I had always toasted nuts on the stovetop or in the oven but Serious Eats had a microwave method that works just as well. Lightly oil the nuts, like 1/2 teaspoon per cup of nuts, then place them in one layer on a microwavable plate. Microwave for a minute, then stir the nuts around and microwave for another minute. Keep doing this for 4 to 8 minutes. I toasted these for 5 minutes and the walnuts were nice and crunchy. Here’s the beautiful basil and mint plants. I used my handy dandy Kitchen Aid 3 1/2 cup food processor to make the basil mint vinaigrette. It took 20 to 30 seconds to finely chop the herbs into small pieces. 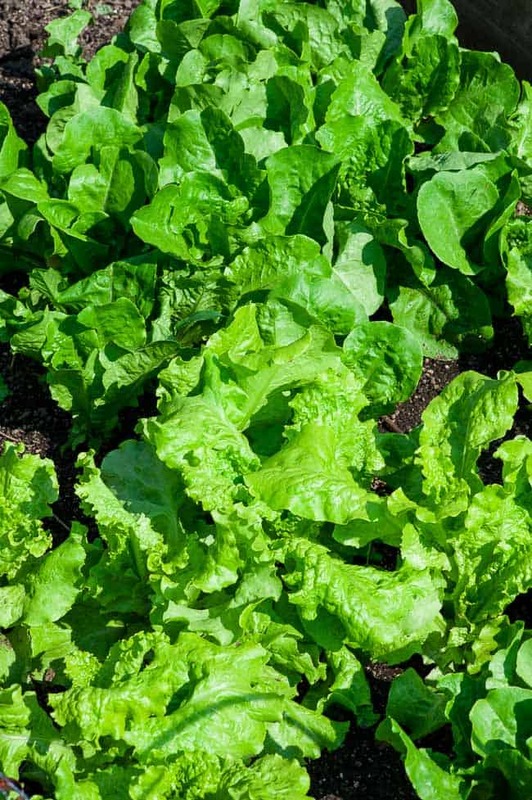 Leaf lettuces in the garden. 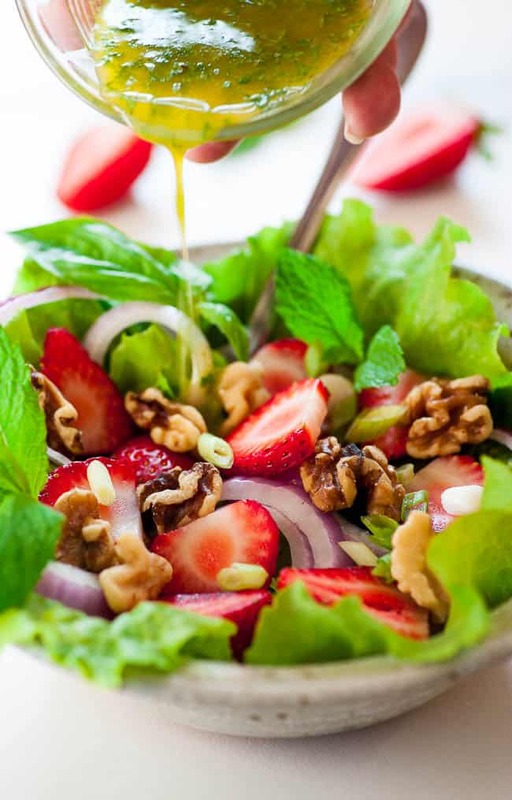 The basil mint vinaigrette is a great flavor combination and paired well with the fresh greens salad, strawberries, walnuts and red onion. Whenever you can take advantage of the bounties of summer, go for it. 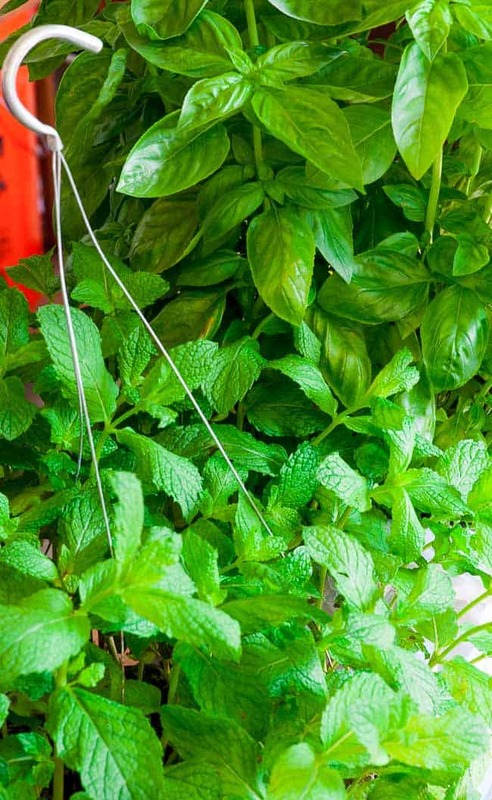 Try basil and mint together. I think you’d really like it. Add vinaigrette to a bowl of greens and vegetables for a family sized tossed salad, or add 2 to 2 1/2 tablespoons to an individual salad. 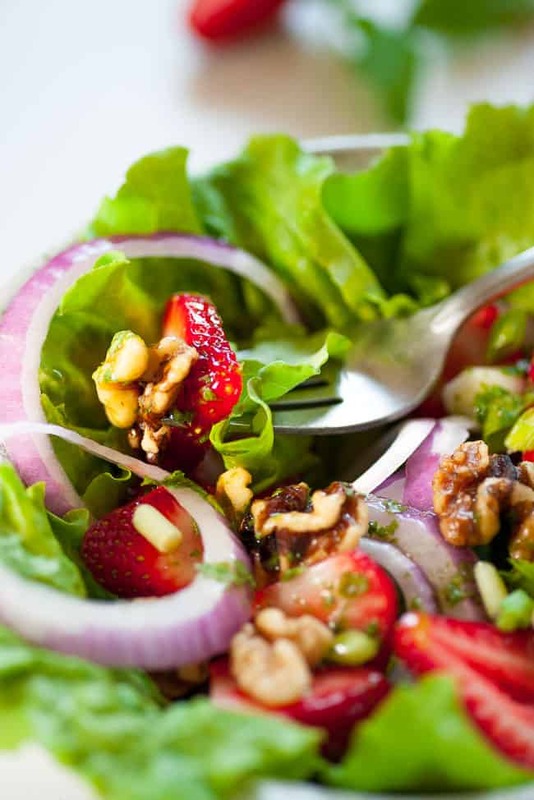 The salad I made consisted of leafy greens, sliced strawberries, toasted walnuts, sliced red onion and a little chopped green onion. 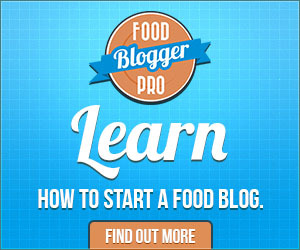 Disclaimer: This recipe post contains an affiliate link which means that Joe’s Healthy Meals will receive a commission for any sales generated through this link. Thanks! This salad looks like it is fresh and tasty. I will definitely try it out soon. Hey Sandi, The vinaigrette is definitely tasty. The combination of basil and mint is wonderful. And toasting the nuts in the microwave is a revelation, as far as I’m concerned! Toasting the nuts makes a big difference in any recipe, but I could never get nuts to come out right on top of the stove, and I hated heating up the whole oven just so I could toast a cup or so of nuts.